Steve Bannon: millionaire banker, right-wing media executive, white nationalist, warmonger, Trump strategist. How did he become the man he is? The leading theory makes very little sense. Marty Bannon, now 95 years old, still regrets the decision and seethes over Washington’s response to the economic crisis. 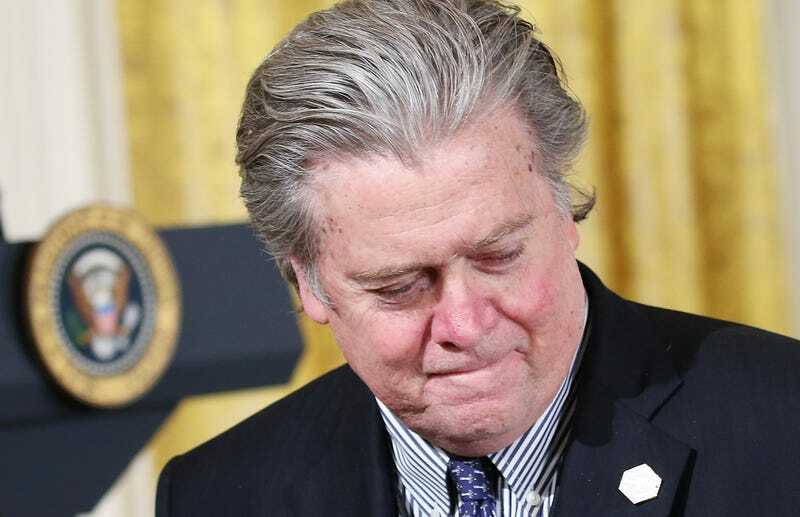 His son Steve says the moment crystallized his own antiestablishment outlook and helped trigger a decadelong political hardening that has landed him inside the West Wing, just steps away from President Donald Trump. Being outraged by the conduct of the financial and political establishment that created the financial crisis and upset that no major executives went to jail as a result: makes perfect sense. Deciding that the appropriate response to the financial crisis is to help install in the White House a right wing, Wall Street-friendly billionaire who plans to dismantle the reforms put in place after the crisis: does not make sense. The 2008 crisis that decimated Steve Bannon’s dad’s stock portfolio came as a result of our government’s failure to properly regulate a financial sector that had in place strong incentives for Wall Street to take huge risks in search of short term gains. This regulatory failure took place over decades under both Democratic and Republican administrations. But the fervor for deregulation of the precious free market is, by any honest measure, a Republican ideal that is still put forward by Republican officials at every turn. The United States political figure who most truly represents the rational response to the financial crisis is Elizabeth Warren, a Democrat who argues for increased regulation and lower risk in the financial system. Steve Bannon is not Elizabeth Warren. Odd. I am in no position to judge Steve Bannon’s honesty, so I’m willing to assume it’s true that the crash is indeed what spawned his political philosophy. If so, Steve Bannon is an insane man. Has he helped to fix the root causes of the 2008 financial crisis by guiding Donald Trump into the White House? No. He has helped to put in power an ignorant billionaire who has vowed to slash Dodd-Frank and other regulations designed to help prevent another financial crisis, and who has turned the regulation of Wall Street over to a coterie of Wall Street insiders and deregulation zealots. The booming stock market and the looming Trump-era deregulation will almost certainly make another financial crisis more, not less, likely. Steve Bannon is rich. His dad will be fine. It’s the rest of us who need to worry now.